One of the coolest things about writing for Casas Fumando is trying out cigars that I may never have come across otherwise. A couple of weeks ago, I received a few samples of EXACTUS cigars, along with a very well put together booklet with the history of the company and products they offer, cigar cutter, and butane lighter. 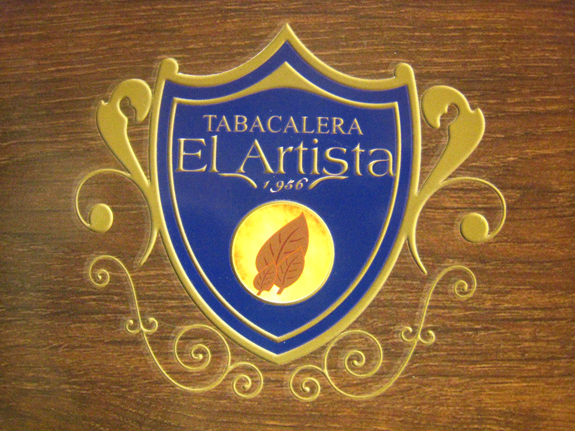 Thanks to the tradition and tireless effort in manufacturing of premium handmade cigars for decades, EXACTUS comes out as the valuable reserve of Tabacalera El Artista, with exact precision to give excellence to the tobacco consumer, joined to satisfaction. This exquisite line of cigar with the exceptional aroma, combustion, and draw, gives to cigar lovers the “Habano”, “Maduro”, and “Clasico” selection, adapting generously to your taste. Each line is available in five vitolas: Robusto (5 by 54), Toro (6 by 50), Torpedo (6 ½ by 52), Churchill (7 by 50) and Coloso (6 by 60). The booklet and website state the size of the Robusto as 6 by 54. I am pretty sure the size is 5 by 54. Just seems to make a lot more sense to me. The bands on all three cigars are identical except for the line of the cigar being located at the bottom of the band stated as either Clasico, Habano, or Maduro. Additionally, all three contain different foot bands with Clasico in black ribbon and the Maduro in gold ribbon. The Habano is a little different, sporting a paper band containing the words “Reserva de Gala”. *For the review, I smoked the Robusto size for all three cigars. And my pairing of choice was water. The Clasico has a very light brown, natural Connecticut wrapper that is fairly consistent in color. A few medium size veins run across the cigar. On the back side, near the band, the wrapper is bunched up and torn. It looks like during the application of the band, the wrapper leaf was caught in it, causing it to tear. This has caused the entire wrapper to begin unraveling with the band being the only thing holding it on. Additionally, the cap has a crack running completely across it. I have not encountered any soft spots, and the Clasico is evenly and firmly packed. The aroma off the wrapper is welcoming with sweet wood and the foot shows off some earthy notes and spice. I clipped the cap very shallow with my Xikar Xi cutter to avoid any additional cracking. The draw is beautiful with just the right amount of resistance. Upon torching the foot of the EXACTUS Clasico, I am greeted with a creamy profile of sweet cedar, dirt, and a peppery spice. The retrohale highlights sweet cedar and leaves behind a minor spice in my sinus passage. As I make my way deeper into the cigar, the sweetness fades and the spice has kicked up a notch. The profile has found its rhythm delivering balanced flavors. Making my way into the final third, the cigar switches gears. The sweet cedar notes are barely perceivable, the earth remains at its core but a bitterness has entered. With an inch and half remaining, it is time to set this cigar down. The flavors were in the mild to medium range and I felt absolutely no nicotine with this stick. The unraveling wrapper had a significant impact on the burn line. A major touch-up was required to get the burn back in line. Since the wrapper was lifted from the binder, the ash appeared a little flaky but it was actually quite firm. The ash held firm for about an inch each time before dropping into my ashtray. Once again the cap contains a crack about the same length and same spot of the crack in the Clasico. I’m beginning to believe the cracks are a result of shipping. The wrapper is medium brown with some bumps and medium size veins. 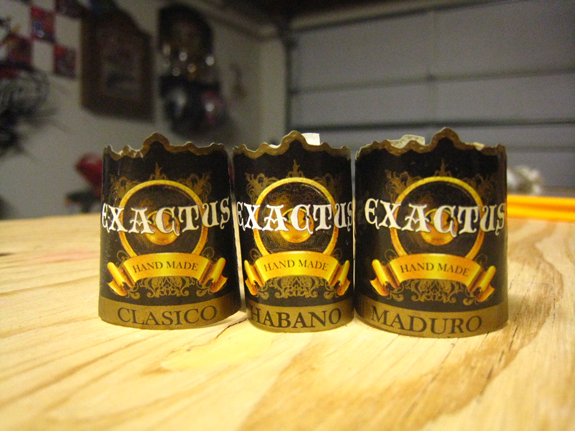 The EXACTUS Habano is evenly packed and gives just a little when pressed. The aroma off the foot and wrapper is faint with only a slight bit of pepper. The draw is free, bringing forth rich tobacco with some cinnamon and pepper. I am tasting a lot of similarities with the Clasico, which is something I expected since the insides (binder and filler) contain the same tobaccos.. The core of the profile is very woodsy with a good amount of pepper and saltiness. The pepper ramps up when retrohaled. Entering into the middle third, flavors of pencil shavings and cedar have arrived in full force. Some sweet bread notes have shown up as well. The last couple of inches of the cigar has become very spicy. A jalapeno-like spice is warming my entire mouth. The cigar ends with earth, black tea, and a very toasty, almost burnt taste. The flavors are on the medium side and with a strength at mild to medium. A copious amount of smoke was given off by this cigar. The burn produced a layered grey and black ash that held firm up to an inch. No touch-ups were required as I took down this EXACTUS Habano. A fine crack formed an inch into the smoke that ran all the way down the cigar. However, the crack did not affect the performance of the cigar. 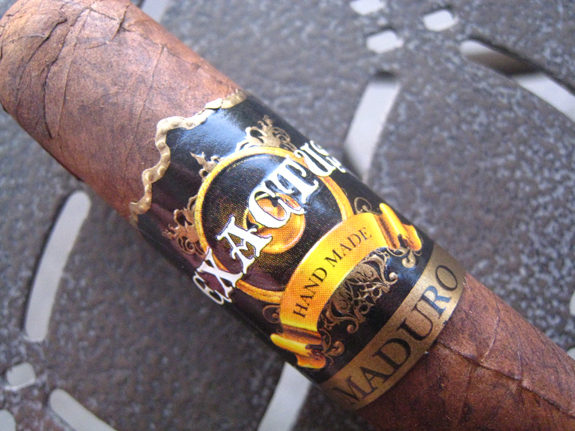 The Dominican Maduro wrapper is very dark with a rusty hue. What appears to be watermarks are scattered around the entire stick. Yep, there is the same crack on the cap. While I am not able to pull much off the foot, it does leave a nice spice that tickles my nose and the wrapper has some barnyard and coffee aromas. The cigar is evenly packed and oils can be felt on my fingers. The draw on the EXACTUS Maduro has a little more resistance than I prefer but it’s not unbearable. The flavors are dark, presenting notes of coffee, cocoa, earth and pepper. The second third is much of the same but the flavors have softened. 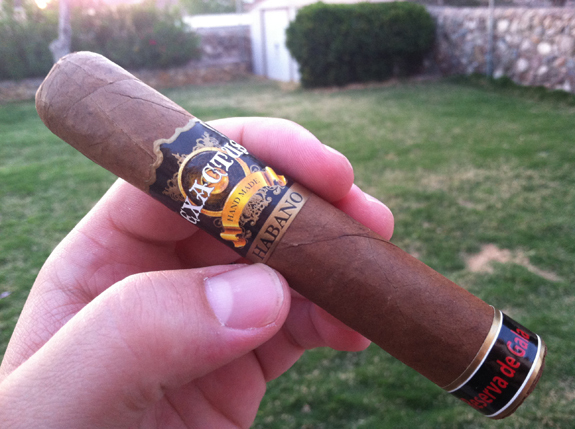 The smoke is light on the palate compared to the creamy texture of the smoke that the Clasico and Habano produced. The spice has continued to increase as I burn through the cigar. My lips are actually stinging a little. The smoke has become very warm in the final third. Letting it rest longer between draws has allowed some cocoa sweetness to show up that is enjoyable. The flavors started off full and are ending in the high medium arena. Putting a close to the Maduro, I am left with a nice nicotine kick. The burn performed excellent through the first and middle third. Approaching the final third, a small touch up was required on one side of the cigar. The white ash held only to three-fourths of an inch before dropping. A big thank you to the crew at Tabacalera El Artista for providing the samples! The construction issues encountered on all the cigars seem to be from travel, so I can’t dock points from that (even though we don’t use a point system). However, I would like to give the cigars a try, especially the Clasico, that don’t have the construction issues. The Maduro was my favorite out of the three. I tend to lean towards darker flavors. A little rest may be helpful, mostly to alleviate the toastyness/ burnt flavors in the final thirds. 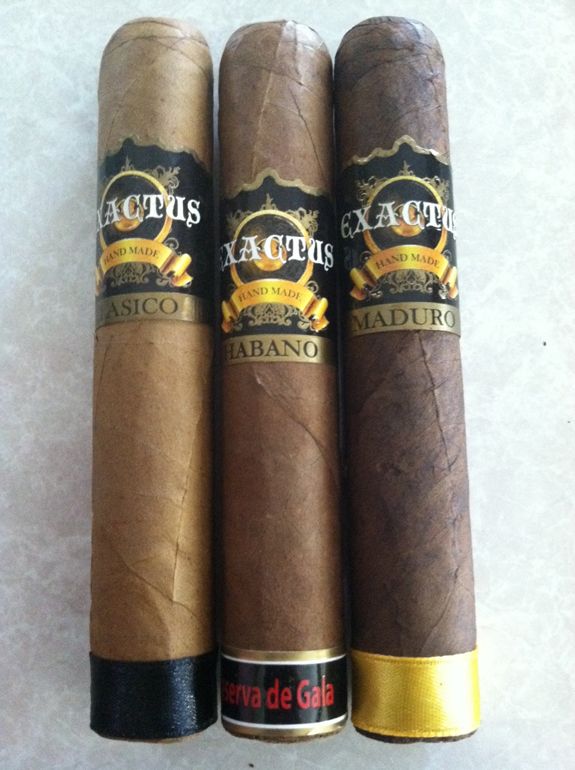 If you are mild, medium, or full cigar smoker, EXACTUS cigars has a cigar that may fit your liking. At this time, the retailer section of their website is under construction. But by doing a simple Google search, I was able to find one online retailer that is carrying the Clasico version of the EXACTUS. 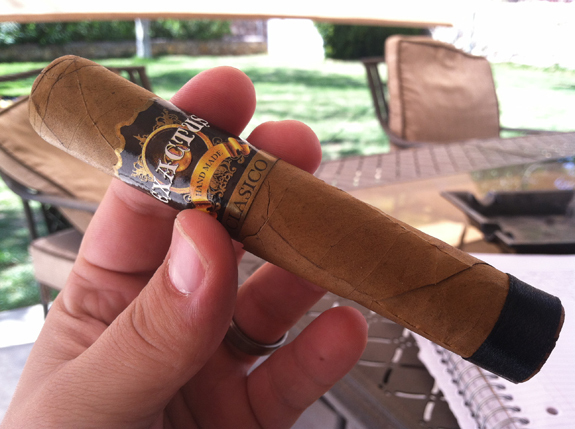 At Thompson Cigars, you can pick up a five pack of the Clasico for $25.00. Thanks Jeremy, it’s always nice to have info about new brands. Thanks for providing the link and checking out the review! The EXACTUS cigars offered some decent flavors but even the $5.00 market is becoming extremely competitive with excellent cigars in that range . I can’t agree more about dealing with Thompson….I try to stay as far away from them as possible. I hope they aren’t a site sponsor.